The Kirin Tor Familiar vanity pet is one of the most challenging pets to collect. It takes patience, perserverence, and a keen eye to earn the Higher Learning achievement that unlocks access to this incredible little arcane elemental. 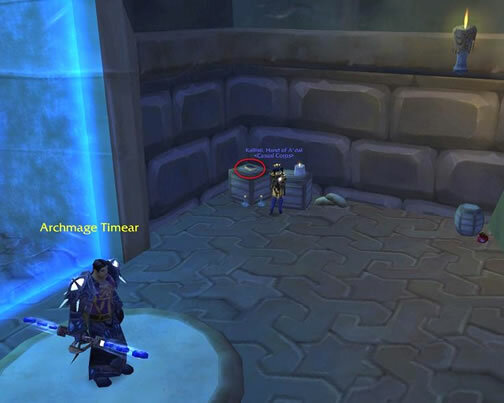 This guide gives you everything you need to earn the achievement as efficiently as possible. 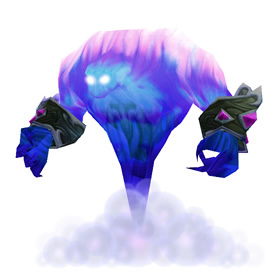 The Kirin Tor Familiar is an arcane elemental vanity pet that may be obtained after completing the Higher Learning achievement. This achievement requires you to read eight different books on The Schools of Arcane Magic (which is a reference to the schools of magic in Dungeons & Dragons). 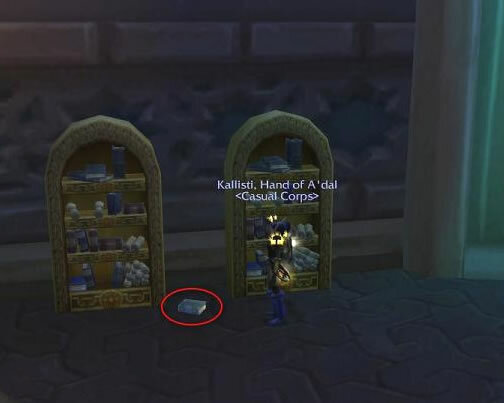 Each book spawns in a specific location in Dalaran. The book that spawns may be the book for the achievement or one of many humorous "flavor" books, which do not give credit for the achievement. If you are fortunate enough to find one of the achievement books, you get credit for reading it by simply clicking on it. There is no channeling involved, and multiple players can read the same book. If you find a flavor text, you should read it in order to reset the timer to try to get the achievement book to spawn. After reading any book, it will despawn three minutes later. A new book will then respawn in 3-4 hours. Once you have completed the achievement, you will receive a book, The Schools of Arcane Magic - Mastery, in the mail from Rhonin, the Leader of the Kirin Tor. Using this book will transport you to the spires atop Violet Citadel, where you will find Archmage Vargoth. After talking to him, he will teach you how to summon your new pet! The Introduction book can be found in the teleportation room of the Violet Gate. It spawns on the ground next to the northeast bookcase (the one that does not have chairs next to it). 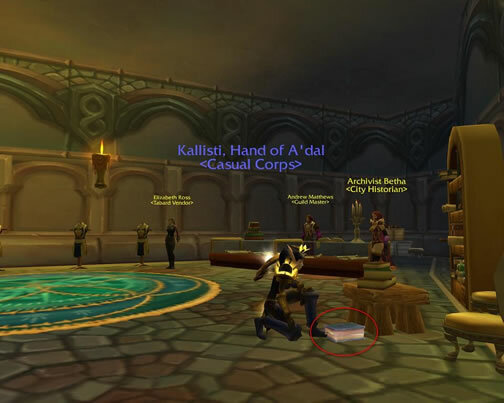 The Abjuration book spawns on the floor of the Dalaran Visitor Center, next to the small table topped with books. 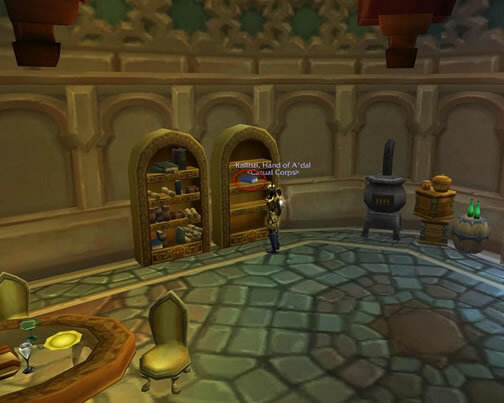 The Conjuration book is located on the 1st floor of the Violet Citadel. It spawns on the left side of the bottom shelf of the left bookcase. 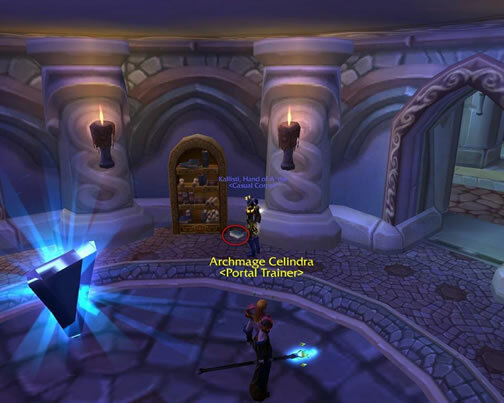 The Divination book can be found on the 2nd floor of the Violet Citadel. It spawns on the floor between the southern bookcases (next to the portal to the Caverns of Time). The Enchantment book can be found on the upstairs balcony of The Threads of Fate shop. It spawns on top of the single small box. 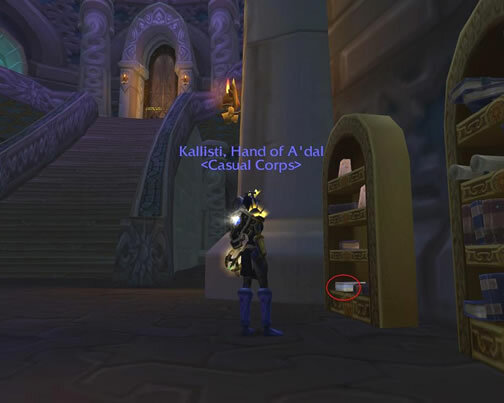 The Illusion book is located in the north corner of the Violet Hold. It spawns on top of the left box near Archmage Timear. The Necromancy book can be found on the 2nd floor of the Legerdemain Lounge. It spawns on the empty bookcase in the northwest bedroom. The Transmutation book is located on the 1st floor of the Legerdemain Lounge. It spawns on the empty bookcase next to the stove. There are two main strategies for collecting books: camping, where you stand by one of the spawn points, and pathing, where you continuously travel between spawn points. 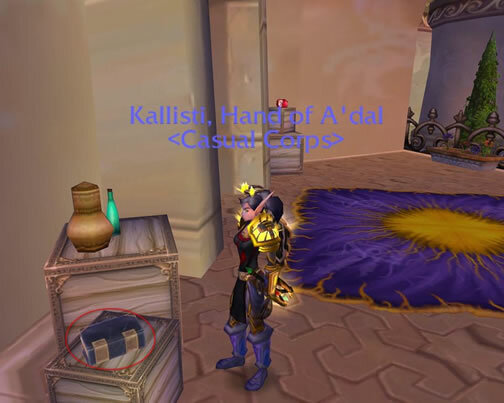 If you have the time to sit in front of your computer and keep running around Dalaran, then pathing will give you the most opportunity to find books. Since the books spawn for at least 3 minutes (longer, if nobody clicks them), you should not miss any books, as an entire circuit of the spawn points requires less than 2 minutes to complete (for an epic mount with no speed enhancements). However, it can be very time-consuming and tedious, especially if you don't know when the books are due to spawn. Camping is much easier to do, and it frees you up to accomplish other tasks while you go afk. The downside is that you could miss the spawn, unless you remember to return to your computer every 3 minutes. Then it would be another 3-4 hours before the book respawns. The best time to find books is immediately following a server restart. At this time, all of the books should be spawned. Once a book is clicked by any player, it will remain up for exactly 3 minutes after the first click. After despawning, a new book will appear between 3 and 4 hours later. To improve your odds of finding books, you should record each time you find one in a particular location. Then add 3 hours to that time to calculate the time when you should start checking that location again. Obviously, if you find an achievement book, you can strike that location off your list and not worry about returning there. Whether you are continuously pathing the city or just casually checking, it helps to have a route planned so that you can search efficiently. The sample route described below is based on my own experience. As you become more experienced in hunting for books, you may discover new tips or tricks for yourself. CAUTION: The numbers in the map above DO NOT indicate the order to travel. The actual order is detailed below. Rather, these numbers correspond to the book locations listed above. Starting at the teleportation room (1), check the floor for the book, and then exit the building to the east. Mount up, head southwest, and enter the Violet Hold (6). Run halfway to Archmage Timear and check for the book on the box. 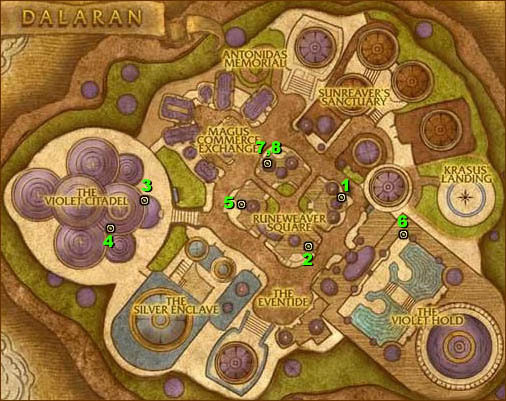 Turn around, exit the hold, and cross the street to the Dalaran Visitor Center (2). Check the floor for a book, and then exit the building the same way you entered. Mount up and resume running southwest. Bear right at the southern tip of the central square and continue northwest to the Violet Citadel (3). Upon entering the building, check the left bookcase for a book. Continue up the stairs and bear left at the top. Check the floor between the bookcases (4). Then jump off the balcony onto the lower level of the citadel. Exit the building and immediately mount up. Cross the street, head up the stairs and bear left until you are under the sign for The Wonderworks. Zoom out and adjust your view to check the small box on the upper balcony of The Threads of Fate (5). If the book is available, proceed to its location. Otherwise, continue up the street, heading northeast. Continue heading northeast until you reach the northern tip of the central square. Bear right and enter the Legerdemain Lounge. Check the empty bookcase next to the stove (8), then head up the stairs on the left. From the top of the stairs, run to the center of the green rug in the hallway. Check the empty bookcase in the bedroom directly across from you (7), then head out onto the balcony to your right. Jump down, mount up, and then bear right. Continue southeast to the teleportation room (1). TIP: If you're a class that has a method to scout (i.e., Priests with Mind Vision, Shamans with Far Sight and Sentry Totem, Warlocks with Eye of Kilrogg, etc. ), try to use that ability to make your circuit easier. We've been told that priests can see all but one book from the same location using Mind Vision. Just employ a little creativity with your class and see where it gets you. Congratulations! You've just completed one circuit. Now rinse and repeat ad nauseum. TIP: Remember that all 8 books will spawn immediately after any server restart. The books will remain until 3 minutes after each one is clicked by a player. Note that they may spawn as junk books, but they will have spawned so it's worth checking. If you know the server is restarting, position your character at the spawn point just before the shutdown. Repeatedly attempt to log back in until you're successful. This is the perfect time to try for any books you might be missing. During your hours of book-searching, you are sure to come across many other players on the same mission. Since multiple players can read the same book, it is to your advantage to befriend these other players so you can work together. If you find someone camping a particular location, ask him which other locations he still needs. Offer to camp another spot and whisper him when the book spawns if he will do the same in return. You can even join a chat channel (ex. /join bookclub) in which likeminded players can share information (via abbreviations) about spawn times and books that are up. If you have friends, family members, or guildmates who are willing to help out, by all means, recruit them to your effort. You can each take a different spawn point and let each other know when a book spawns. If you have multiple computers and multiple accounts, you can have one character from each account camp a separate spot to increase your odds. 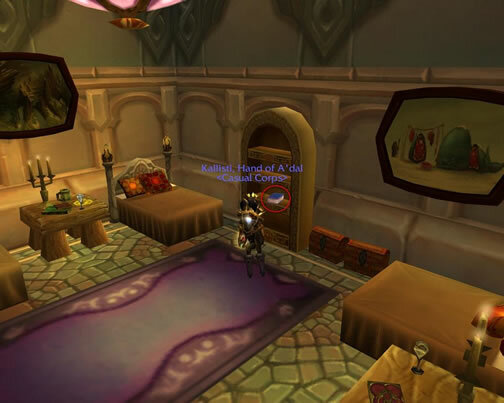 This guide is based on information from Wowhead.com, members of WarcraftPets.com, and my personal in-game experience. I would like to give special thanks to Aikiwoce for first reporting this pet and to Kallisti for submitting the book location screenshots.